Nestled between downtown and Union Station lies El Pueblo de Los Angles Historic Monument. This several block area feels like a Mexican village. A plaza fills with several generations of families where women greet each other in Spanish while keeping an eye on toddlers. Teenagers lounge around a band stand that is being readied for the afternoon performance of Mexican pop music. There is a procession up the steps of the white- washed church. And a crowd flows back and forth down Olvera Street, the birthplace of the city of Los Angeles. It is the morning of Cinco de Mayo, Mexican independence day, and we stroll the 2-block long street letting the festive feeling wash over us. Twenty-seven historic buildings of stone, brick and wrought iron edge the street. Weathered wooden doors are draped with a clutter of guitars, bright clothing and Made in Mexico souvenirs. We visit the oldest house in Los Angles, the well-preserved Avila Abode, built in 1818 following the original town plan that formed the plaza, church and street. In 1769 an early expedition sent from Mexico to explore Alta California entered a wide river basin and noted “All the soil is black and loamy, and is capable of producing every kind of grain and fruit which may be planted. We went west, continually over good land well covered with grass.” They also recorded the presence of a nearby thriving native Indian village called Yaanga. A few years later, the survival and success of early Los Angeles would depend greatly upon Yaanga to provide the colonists with seafood, fish, bowls, pelts, and baskets. Soon, however, settlers and soldiers began to stay and acquire plots of land for farming and ranching near the pueblo. The local Indians tended fields and herds, dug water ditches, hauled drinking water, and provided domestic help in exchange for clothing, other goods and alcohol. Native women intermarried with the Mexican colonists, raising families of “Californios”. By 1818, Los Angeles was a self-sustaining farming community, the largest in Southern California. A town plan called for a central plaza and a church. Adobe homes around the plaza were built by Ranchero families to live in when they came to town for mass, visit with friends, festival days or tend to business affairs. One of the first was the Avila Adobe, constructed by Don Francisco Avila, who had immigrated from Sinaloa, Mexico in 1794 and became a prosperous cattle rancher. Through the late1800’s the Los Angeles city center moved steadily southwest leaving the original pueblo to decline. This neglected area had so deteriorated that in 1928 the city condemned the Avila Adobe for “unsanitary conditions and defective construction”. Christine Sterling, a local woman with influential friends, became the new angel of the pueblo. She sought talent and funds to rescue original buildings and transform the area. 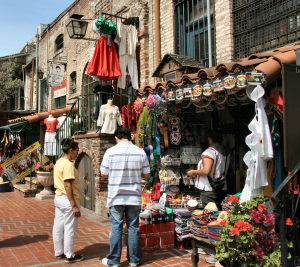 In 1930, Olvera Street arose restored as a Mexican marketplace and cultural area. The Avila Adobe reflects domestic Ranchero life in 1840’s California, before the Americans came. My first visit to Olvera Street was on a family vacation during the 1960’s when I was seven. My sister and I searched the shops, gawking at the striking sombreros, painted maracas and elaborate dolls costumed in flowing skirts and mantillas. We walked the length of the street carefully inspecting the souvenirs we might spend our allowance on. My mother was envisioning the romance of Old California and choose a restaurant where we dined on a patio under ancient trees. A fountain burbled and a band strolled between the tables while we ate. The waiter called me sister and I “Senorita” and brought us bright paper flowers. It felt like a special place. 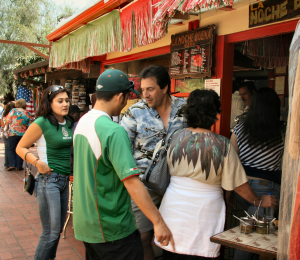 During this recent trip we joined the line in front of La Noche Buena at #12 Olvera Street. It is little more then a taco stand, a tiny active kitchen with five tables. This is simple Mexican street and market place food. 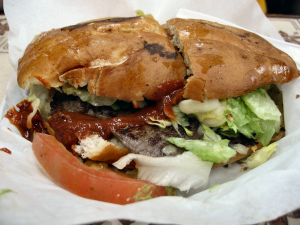 The Torta was recommended as the original California fast food. The bun is grilled, a thin beef steak is quickly seared and assembled with lettuce and tomatoes. You accent it to taste with tomatillo sauce or red chili sauce. It may not be the best thing you ever ate but everything here is made to order… crisp, hot and real.